October | 2011 | What about this? Scrunch it up into a ball and use it to scrub baked-on food off of oven racks, barbecues, grills, pots and pans. Wipe it down with soap and water and reuse it. Aluminum foil that has not been in contact with raw meat can be used to cover other foods again. Sharpen scissors and garden shears by folding a piece into several layers and cutting through it with scissors or shears. Paper punches can be sharpened in this way as well. Stuff clean used foil in your shoes and boots to help them keep their shape. Deter birds, deer and other unwanted pests by hanging strips of foil around your garden. Throw a crumbled piece of foil into the clothes dryer with your clothes to reduce static electricity. Place some under your ironing board cover to reflect heat and iron more efficiently. Save it for arts and craft activities: make cards, pretend jewelry for your kids; mold it into a sculpture; use it to create interesting textures in paint. Stuff some around pipe holes to prevent rodents from entering your home. Clean your silver by putting aluminum foil in your sink with salt, baking soda and hot water. Wrap some around stripped screws before screwing it in for a quick, temporary fix. #3 – Oh My Aching Back! My lower back and hip area was stiff and achy from standing all day. I mentioned this to my husband and before I could finish my sentence, he ran out of the room to get something. A few minutes later he came back with two tennis balls duct-taped together. 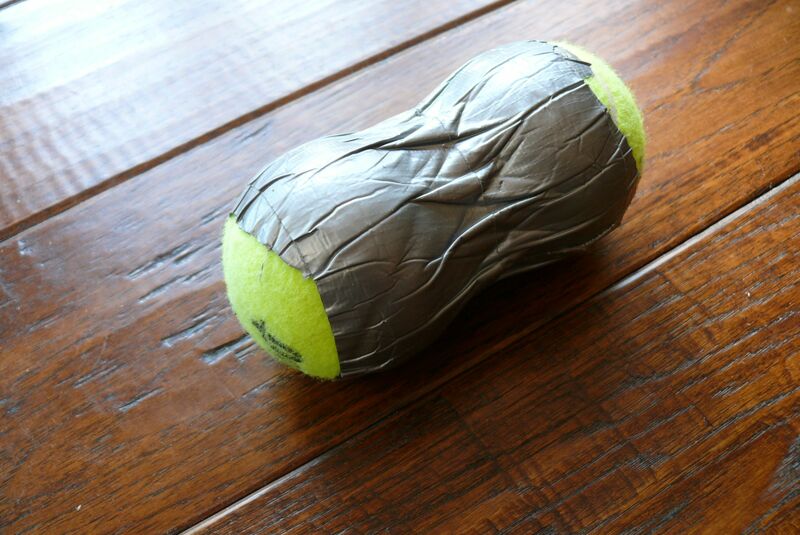 “Here,” he said, “Roll on this, it will really help!” I looked at him incredulously and said, “Seriously?” But he was right, after a minute or two of rolling on the tennis balls and enduring shiatsu-massage-type discomfort, my back pain significantly diminished. If you suffer from back and hip pain, don’t let the simplicity of this gadget fool you and do give tennis ball therapy a try! Halloween conjures up images of black cats, but Sushi Cat creates FAT CATS! Sushi Cat is a fun computer game that combines pinball-like skills with eating sushi! Drop a cat from the top of your screen and watch him eat sushi as he eats his way around obstacles. He must eat the prerequisite number of sushi pieces at each level to become a FAT CAT or else you must try again! Enjoy this last week of October! 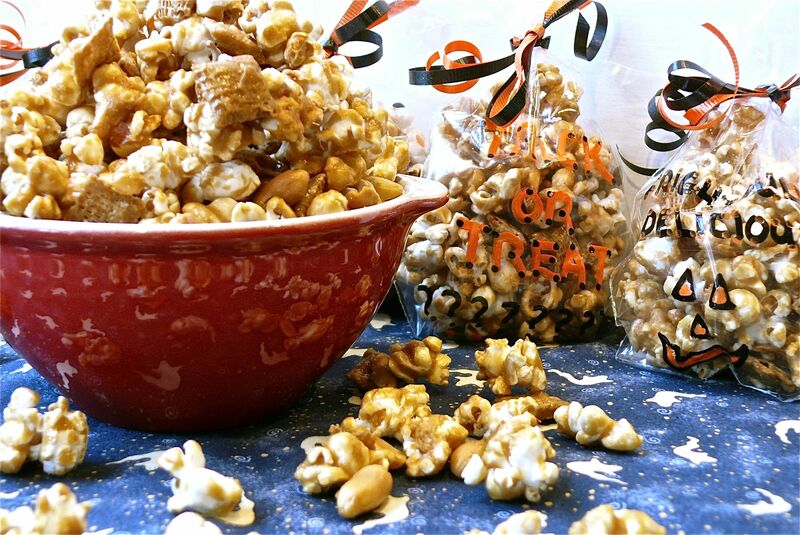 The sweet scent of caramel corn permeates my kitchen and transports me back in time. As a young child I remember shopping with my mom at Valley Fair Mall. Back in those days it was an outdoor mall anchored by big stores called the Emporium and Joseph Magnin. While walking from store to store, we would always pass a little caramel corn shop and be seduced by the smell wafting out of the door. My sister and I would beg our mom to stop and buy us some. Having a sweet tooth of her own, my mom usually consented. Carrying a cardboard carton bearing a capital “K” filled to the brim with the most delicately-coated, buttery- sweet, caramel popcorn imaginable, my sister and I would lag behind mom while grabbing handfuls of the treat and stuffing our faces. Valley Fair is now an enclosed mall and the Emporium and Joseph Magnin stores are long gone, as is the little caramel corn shop whose name I can no longer remember. I make my own caramel corn now and it seems fitting that this great recipe came from my sister. With butter, brown sugar, and its secret ingredient – Mrs. Butterworth’s Original Syrup – it’s almost as good as the caramel corn of my youth! 3. 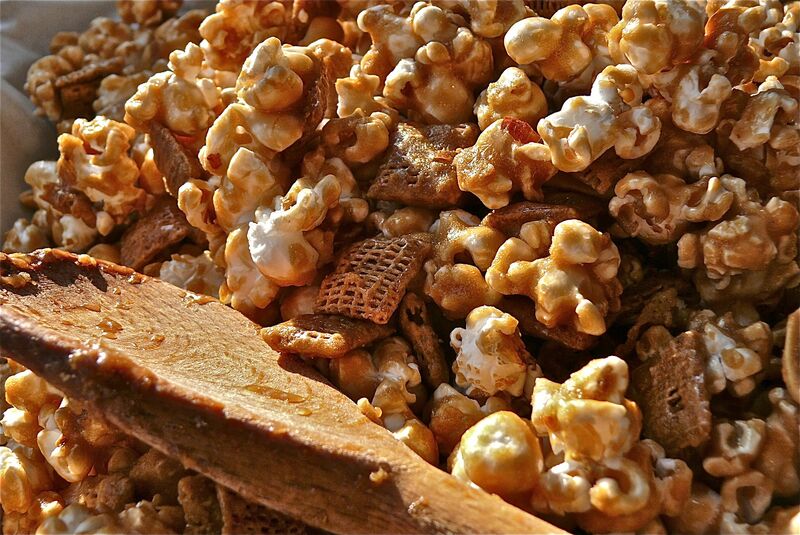 Put popped popcorn, Wheat Chex, and peanuts in a large bowl and toss to mix. Set aside. 4. Using a medium-large saucepan with high sides, melt the butter, syrup, and sugar on medium heat until bubbles form on the side of the pot. Heat for 5 minutes longer. DO NOT OVERCOOK! 5. Remove pot from heat and stir in salt and baking soda. The mixture will get foamy. 6. Pour caramel foam over popcorn mixture and quickly stir to coat evenly. 7. Spread mixture onto the two baking sheets. 8. Bake for one hour, stirring the caramel corn every 15 minutes. 9. Remove from oven and let cool completely. 1. Be very careful with the hot caramel. Being hot and sticky, it can cause a bad burn! One time I accidentally got some on my knuckle and ended up with a pretty significant burn blister. 2. If you do not want to add the cereal or the nuts, use 15 cups of popped popcorn instead. Also, any type of Chex-type cereal can be substituted for the Wheat Chex. 3. Containers of this caramel corn make great gifts. When my husband and I were poor college students we often made several big batches of this caramel corn, packaged it in cute containers and gave them away as Christmas gifts. 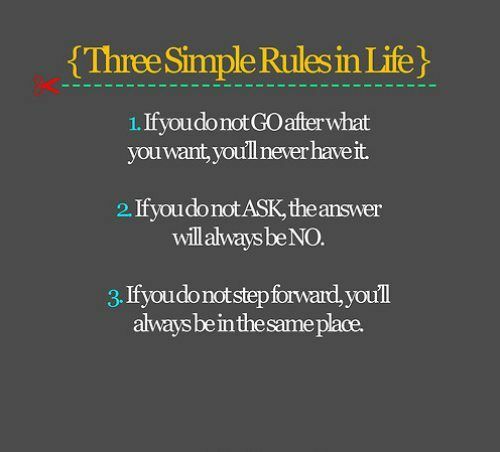 Are there only three simple rules in life? Is life really that straightforward and uncomplicated? I hardly think so, but these three rules command us to take action and to be in charge of our own lives. It’s a rather egocentric outlook on life, but we all know that thinking about things doesn’t make them happen and that the best intentions are often times just not good enough. Being proactive on all fronts of our lives pushes us to be better and helps us to strive towards the lives we want. After all is said and done, we can only blame ourselves if our lives didn’t evolve the way we’d hoped. Take action while you watch television. This is the best of both worlds – watching television and working out. I don’t watch a lot of television, but after viewing Heidi Klum’s Commercial Breaks workout and breaking out the exercise mat, I won’t feel quite as guilty on the days that I don’t hit the gym! If you’re sitting at your computer and need to text message someone, say your child who only communicates via texts or your boss who is in a meeting, there’s no need to get out your cell phone. You can send a text message from any computer to any cell phone that has instant messaging abilities. Practically all cell phones have an established email/text address, but you must know the phone’s service carrier first to figure out its email address. This is a great way for my parents’ generation, who are computer savvy, but not text savvy, to get in touch with family in a jiffy. To set up an email contact for a cell phone: Create a new contact/new address in your computer’s email program, e.g., Jane’s iPhone. Add the email address which consists of the phone’s 10 digit cell phone number (without spaces or dashes) and its service provider’s email information. * Jane’s iPhone carrier is AT&T, so her cell phone’s email address looks like this: 5303214567@txt.att.net. *Every phone carrier has a unique email suffix (all the information after the @ sign), so you will need to know the service provider for each particular phone. Click here for a link to service carriers’ suffixes. Now when you want to send a contact a text message, just type in the name and the corresponding cell phone email address will pop up. Shortly after typing in your message and sending it, the contact will receive an instant message alert on their cell phone. Recently my cousin told me her son was going to have his wisdom teeth removed. I shared with her a tip that one of my sons used to reduce his post-surgery swelling and then decided it was a tip worth sharing with all of you. After I brought my son home from the oral surgeon’s office, he went to his room and put on a hoodie-type sweatshirt. He then went to the freezer, grabbed a couple bags of frozen peas and settled himself down on the family room sofa to rest. When I checked to see how he was doing, I saw the bags of frozen peas nestled in between the outsides of his cheeks and the hood of his sweatshirt. He had pulled the drawstring of his hood tight, so that the frozen bags contoured around his face and stayed in place. He figured this way he could ice four quadrants all at once. Clever boy that son of mine! Of course, frozen gel ice packs or bags of crushed ice would also work! It all began this morning after I spotted a pot of unruly Corkscrew Grass sitting on a shelf in a grocery store. I thought to myself, “That would make a great head of hair for something.” Then in a Martha Stewart-moment, I turned my shopping cart around and went outside to find a head, or a pumpkin to be more specific. After selecting three “perfect” pumpkins and taking them home, the five-year-old in me began sawing away at them with no special design in mind. That’s not to say, though, that I didn’t have a purpose in mind. 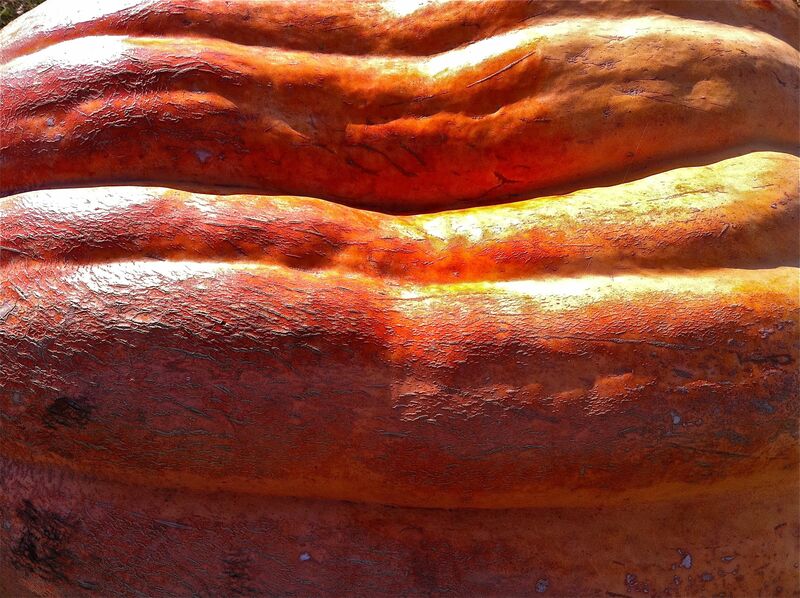 With a pumpkin carving saw in hand, I cut classic sawtooth edges around the tops of each pumpkin. And after a gentle tug on each stem, the lids came off to reveal a stringy mass and a cache of seeds. I imagined this must be similar to what a neurosurgeon feels after he’s removed a piece of skull and gets his first look into the brain! 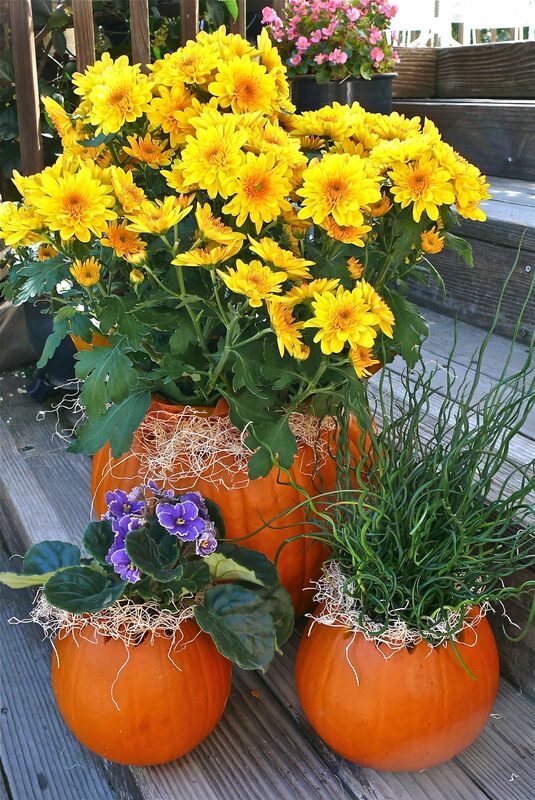 Although a session of pumpkin carving interrupted my morning schedule, I felt very satisfied after I put my three pumpkin flower pots on my door steps. Nothing ingenious or original about this project, but the look of autumn has finally come to my house! 1. Wash and dry exteriors of pumpkins. 2. Decide which plant will go into which pumpkin. 3. Measure diameter of the top of each potted plant container. 4. With tape measure, center the number of inches of the pot’s diameter across the pumpkin top. 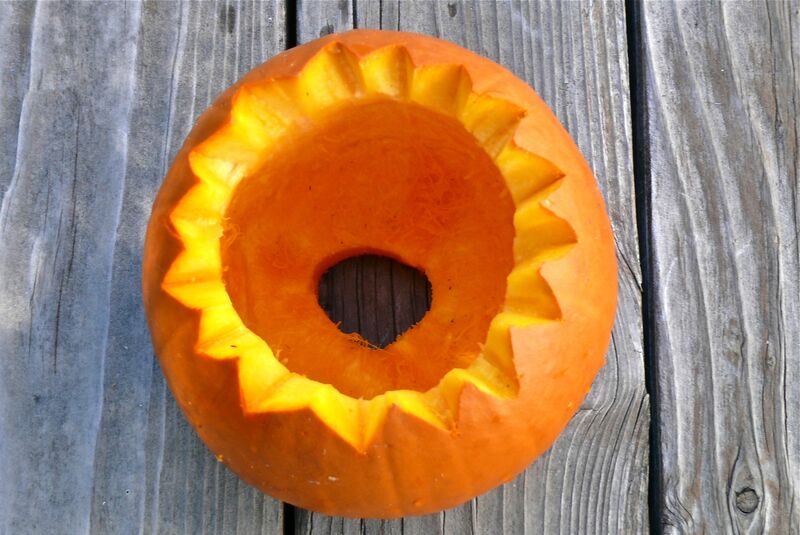 Using a push pin, poke holes in the pumpkin to serve as a cutting guide. 5. Carefully cut a sawtooth pattern around the top. 6. Remove lid and scoop out seeds. Save the seeds for roasting or making Pumpkin Brittle. 7. Clean inside of pumpkins thoroughly. Using a spoon’s edge, scrape the sides of the pumpkins interiors until all stringy fibers are gone. Put that stringy stuff into your compost pile! 8. Cut a hole in bottom of the pumpkins, around the blossom spot, for plant drainage. 9. Either take the plant out of the pot and plant it directly into the pumpkin – recognizing that after Halloween, you are going to plant the whole thing, pumpkin and all, into the ground – or position the potted plant, plastic pot and all, into the pumpkin. If you find the pot does not fit, take a sharp knife and trim away some of the pumpkin flesh on the inside. 10. It’s optional, but I elected to put a little wood excelsior between the edges of the pots and the pumpkins to soften the look. 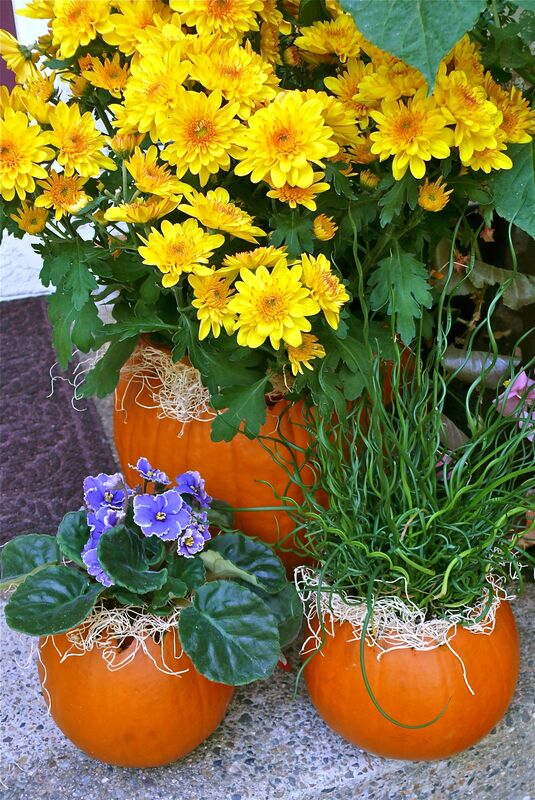 Update: These pumpkin pots will last longer if you spray the interiors with a disinfectant like Lysol before placing potted plants inside them. 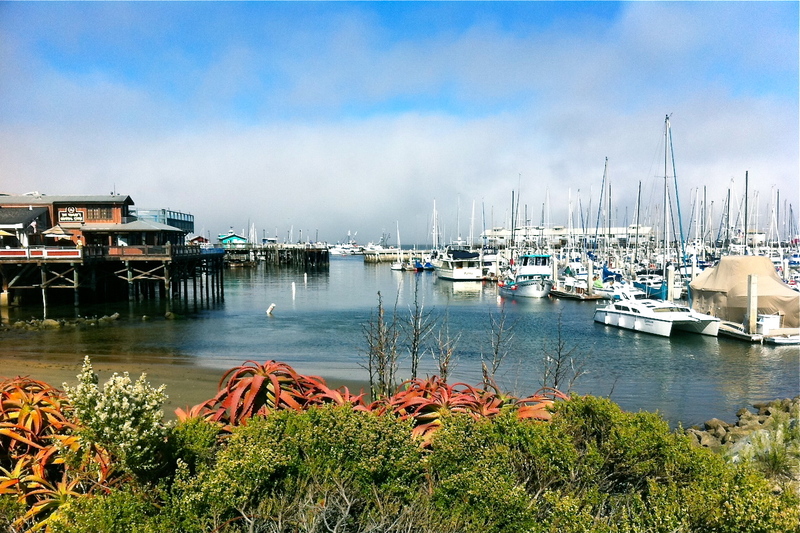 Going to scenic Monterey, California, was no longer an option. Undeniably, I was coming down with some poorly-timed illness and my hopes of tagging along on one of my husband’s business trips were swallowed along with an Advil. Allowing myself only a half-hour-long pity-party, I decided to spin the situation into a positive one. I could prevent a few pesky pounds of weight gain by not dining out at all those wonderful seafood restaurants, right? And I considered the perk of being housebound as a gift of much desired reading time. Plus, I rationalized that nobody could oversee the recovery from Xylitol poisoning of Romeo, my neurotic dog, better than his mommy. Disappointment evaporated into gratitude. #1 – Are You Rich? Having a bad day? From Marc and Angel Hack Life comes another great list. This list is a reminder of how the ups and downs in life are a matter of perspective. 1. You didn’t go to sleep hungry last night. 2. You didn’t go to sleep outside. 5. You didn’t spend a minute in fear. While cardio burns more calories than resistance training during your workout, lifting weights torches more fat overall. In a study published in The Journal of Strength and Conditioning Research, women who completed an hour-long strength-training workout burned an average of 100 more calories in the 24 hours afterward than those who skipped the weights. The more muscle owned, the more fat burned. #5 – What Are You Waiting For? Tell someone you love them this weekend! Tried-and-true recipes that are handed down from mother to child or shared from friend to friend are the jewels in every woman’s recipe collection. A tattered pink index card holds an all-time favorite sour cream coffee cake recipe of mine, and is a good example of a jewel in my collection. Even though I can’t recall the source of the recipe, the delicious ribbons of nuts, sugar and cinnamon swirling through a moist cake are unforgettable. Coffee cakes just don’t get better than that. That is, until now! From the Grand Central Baking Book comes this easy and well-written recipe that has several great things going for it. One – the recipe is from the Grand Central Bakery, a renowned bakery in the Pacific Northwest. Two – the coffee cake bakes in a 9 by 13-inch pan instead of a deep tube or bundt pan, thus decreasing baking time. Three – this coffee cake offers the versatility of adding a layer of fresh seasonal fruit on top of a delicate, moist cake. Four – a crunchy oat streusel covers the fresh fruit. The author likens it to a fruit crisp on top of a cake. You’ll want to add this “jewel” of a recipe to your own collection! 1. Preheat the oven to 350 degrees F. Lightly grease and flour a 9 by 13-inch baking pan. 2. Dice the butter into ¼- to ½-inch cubes, then combine it with the granulated and brown sugars, flour, and salt. Use two knives, a pastry blender, or your fingers to mix the ingredients until crumbly, then mix in the oats. If you’re making the streusel ahead of time, cover and refrigerate it until you’re ready to proceed with the recipe. 3. Sift the flour, sugar, baking powder, and salt into a bowl with high sides. Make a well in the center. 5. Scrape the batter into the prepared pan. Distribute the fruit in an even layer over the batter, then sprinkle evenly with the streusel. Bake for 45 minutes, rotating the pan halfway through the baking time. The streusel should be crunchy and brown, and a skewer inserted in the center should come out clean. 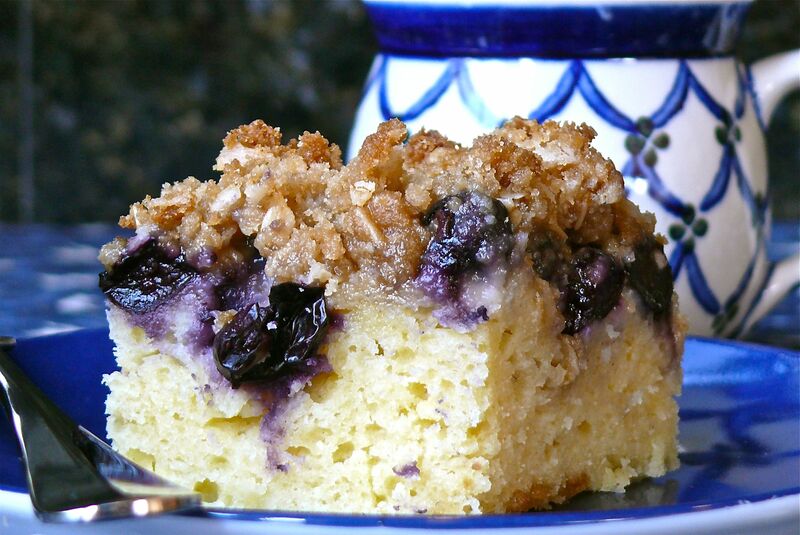 Serve the coffee cake straight from the oven with plenty of fresh, piping hot coffee. I used fresh blueberries that I tossed in a little bit of flour first to prevent them from sinking and turning the batter purple. This cake stays moist for days – not that it would last that long, but there are only two of us at home to eat it! Sitting at my desk and admiring the sleek beauty of my iMac computer, I think with sadness about the passing of Steve Jobs. His combination of creative intelligence and technological genius definitely put the “ding in the universe” that he so wanted. He challenged and inspired us with his innovations and changed the world forever. Take a moment and read the 20 Most Inspirational Quotes By Steve Jobs. 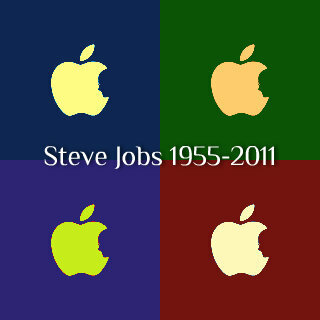 Using the site iPiccy, I downloaded the graphic of Steve Job’s silhouette and the Apple logo, quadrupled the image, selected colors, and added text all within 15 minutes. Because iPiccy is so easy to use and is fun to experiment with, you’ll find yourself searching your photo library for more photos on which to test techniques and effects. Why not plan ahead and create something interesting for your holiday cards? • Over 2,500 varieties of apples are grown in the United States and 7,500 varieties are grown worldwide. • Apples are grown in all 50 states. • The first recorded apple tree planting was in 1629 by the Massachusetts Bay Colony. • Americans eat about 19.6 pounds of fresh apples annually, compared to about 46 pounds consumed annually by residents of European countries. • Apples are a member of the rose family. • A medium-sized apple contains about 80 calories. • Apples float because 25% of an apple’s volume is air. • Two pounds of apples make one 9-inch pie. • Apples contain no fat, cholesterol, or sodium. • Apples are a great source of pectin, a water-soluble fiber found to reduce levels of cholesterol by removing it from the blood stream. • Apples contain boron, an essential trace element that helps to harden bones, which may reduce the onset of osteoporosis. • Apples are best stored in a plastic bag in your refrigerator. I wasn’t expecting much after I took this quick and simple Color Quiz. I knew color selection affects behavior and learning styles, but I didn’t really appreciate how much it could reveal about a person’s emotional state. Maybe it was just my mood yesterday, but my test results were interestingly accurate. Take the quiz and find out what color selection says about you?